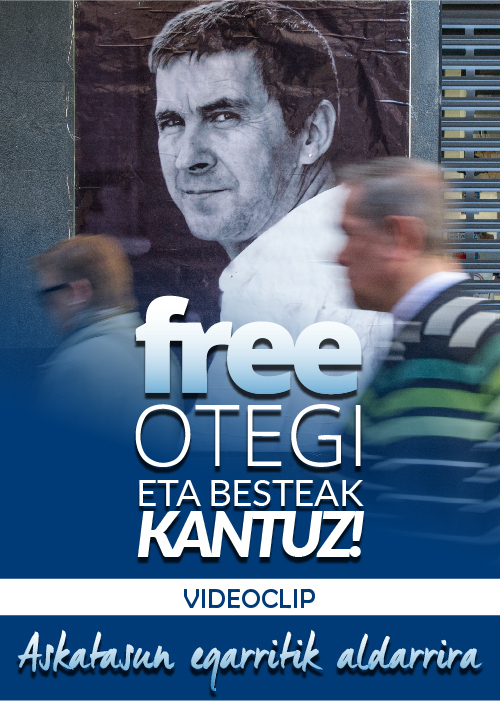 Important names from Catalan culture such as Luis Llach, Jaume Cabré and Montserrat Carulla, as well as political representatives yesterday joined the campaign “Free Otegi, Free them All”. They did it in an act which took place in Barcelona, at which participated, among others, Gabriela Serra, August Gil de Matamala and close friends and family members of the prisoner in Logroño. The handing over of an olive tree on the part of the promotors to relatives of Arnaldo Otego present yesterday in Barcelona, in a clear allusion to the olive branch extended by the Aberztale leader in Anoeta in 2004, resumed yesterday’s act. In the Catalan Countries they don’t let the extended branch fall. A sign of that was that the manifesto “Freedom for Arnaldo Otegi; Bring Basque prisoners home”, presented this past March in the European Parliament in Brussels, received yesterday a long list of adhesions coming from the political, cultural and academic world of the Catalan Countries. An explicit support in an act which took place yesterday afternoon in the Centre Internacional Escarré per a les Minories Etniques i les Naciones (Ciemen) of Barcelona, in which participated signatories, as well as Julia Arregi and Hodei Otego, the companion and son of the Abertzale leader imprisoned in Logroño. With the presence of distinguished people such as David Fernandez (CUP, Joan Tardá (ERC), wrier Julia de Jódar and the professor fo the UAB Joan Subirats in the hall, the president of Ciemen, Carles Riera, opened by declaring his “profound indignation” for the situation of Otegi, which he presented as “one of so many unjust imprisonments for political reasons. The act continues with the human rights activist Gabriela Serra, who was in charge of reading the manifesto, not without before reclaiming that “facing the absolute blindness and deafness of some concerning the rights of the prisoners, and their relatives, the only thing is to continue”. 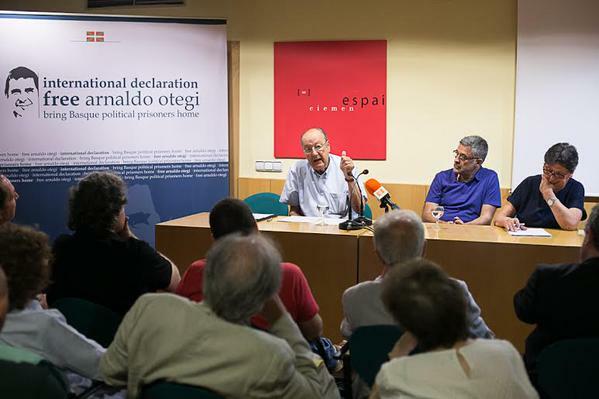 Following her was the veteran and renowned jurist August Gil Matamala, who began in a clear way: “It’s the fourth manifesto that I sign for the freedom of Otegi, this is a monumental legal and political scandal”. Gil de Matamala was in charge of going over the legal incongruences that brought the Abertzale leader to prison and ended with a warning: “They seek the twisted way of impeding that he can present himself in the elections. They will have it difficult, but nothing is impossible in this Kingdom of arbitrariness”. Joined in a confused electoral campaign with an uncertain final, it isn’t easy today to join the diverse political sensibilities present in Catalonia in a common action. In the list of the Catalan adhesions to the campaign “Free Otegi, Free Them All” we find, however political representatives who come Convergencia (Victor terradellas) to Podemos (the lawyer and councillor for Barcelona for Comú, Jaume Asens), passing for the least surprising firms of the deputy of CUP David Fernandez, the deputy Gemma Calvet and the congressman Joan Tardá, and until recently the head of the ICV in Barcelona Ricard Gomá. In the list it is worth pointing names from Catalan culture such as the singer-songwriter and now author Luis Llach, the also prestigious novelists Jaume Cabré (author of “Les veus del Pam Pamano” or “Jo Confesso”, among other titles), singer-songwriter from Valencia Feliu Ventura and the veteran and renowned actress Montserrat Carrulla. It was signed by the not so veteran actor Sergi Lopez and the author Julia de Jódar. In the same way we find the among the adhesions representatives of the academic world such as Antoni Batista, Salvador Cardús, Jordi Muñoz and Joan Sobirats. From the activist world came firms such as that of Arcadi Oliveras and Gabriela Serra, present in yesterday’s act. Finally, journalists also signed such as the director of Vilaweb, Vicent Partal.